In the frozen bitter wastes of the Siberian North, boredom, frustration and lack of a creative outlet spawned new and ever more extremes of human sporting endeavour. With few materials, no roads, but an excess of heavily snow-covered mountainous slopes, inspiration for a new Winter sport was born: the One Man Dread Sled. 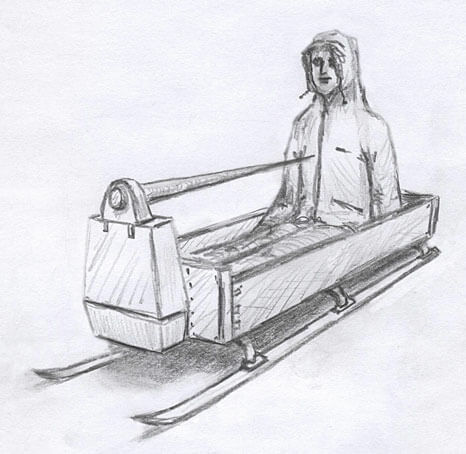 Basically a degenerate toboggan consisting of runners, a metal bucket for the passenger, and last but not least a variety of deadly accoutrements whose sole purpose is to inflict injury (or ideally death) on the passenger, the Dread Sled replaced Russian Roulette as the pastime of choice for the suicidal. True purists of the sport also insist upon being unable to extricate themselves from the sled under any circumstances. Once strapped in place, man and bucket are simply pushed down the nearest steep slope. Some vague steering ability can be achieved by violent shifting of the body weight, but it is mainly down to luck that the rider misses all trees, rocks (any sudden stop spells instant impalement) or perhaps worse, ponds of icy water where the toboggan is apt to roll upside down and slowly sink, drowning its passenger in freezing water. Shown here is one of the true champions of the sport, Sergei “Mad” Ooblyoodkee, posing in a publicity photo shot just before his record-breaking attempt to achieve the first (non-fatal) traversal of the famous Black Run near Novokuznetsk. Not seen from this angle is the skeleton frame holding him bolt upright, and the ankle and wrist restraints. Once in place, he has no choice but to finish the race. Starved of any real news, such insane attempts attract a great deal of publicity from the local populace and it is no surprise that Sergei’s “Man-Bucket Slay Ride” (sic) was front page news. Less civilised regions have adapted this practice to be used as a test of faith or honesty (similar to other devices – see reference at end). Surely God will protect any innocents souls who are strapped into the sleigh and launched into uncertainty.